BULLARDS The property of Messrs. Bullard by at least August 1873, but lease held by Eyre & Co. Non specified proceedings are reported in Norwich Court against Benjamin Powley 21st August 1872. See opposite. Elizabeth Ballard, widow, announced 12th March 1874 that she would carry on the business of her late husband. John Howard, late of the WHITE LION, Holt, announced 17th January 1795 that he had taken the PITT's ARMS. Renamed 1811, after Captain Sir William Hoste. Parson Woodforde stayed 12th September 1787 and recorded the innkeepers name as Ballard. Conveyed between Edward Everard and Richard Sands in a conveyance dated 4th March 1856. The Jolly Farmers at North Creake was also included in the transaction. 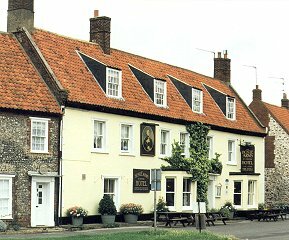 In a notification published 24th December 1870, Benjamin Powley announced that he had taken the Inn, but would still be carring on his business as Brewer and Innkeeper at the THREE HORSE SHOES INN, Roydon. It was reported 6th September 1873 that following the bankruptcy of Mr. Powley, the house had been closed. At the July 1873 Sessions the licence had been transferred to Mr. Bales. On Saturday 30th August, the award of a licence to Mr. Bales was opposed by the representative of Eyres & Co. who had a lease on the property until Michaelmas. Messrs. Bullard had offered to pay £15 per month to Eyres & Co, up to the expiry of lease, but Eyres sought payment of 8s 6d in the pound, on the debt that Powley owed them. The Bench interceded in the argument and confirmed the licence. The death occurred at his residence, The Hoste Arms Hotel, on Tuesday of Mr. John Wharton Womack. He came to Burnham at Michaelmas 1910 and has been in ill-health for a considerable time. He was 63 years of age, and the second son of the late Mr. John Womack of North Lopham. Previous to coming to Burnham, Mr. Womack was licensee at East Harling. He leaves a widow and five daughters and two sons for whom much sympathy is felt. Very popular and has many recommendations for fine food.